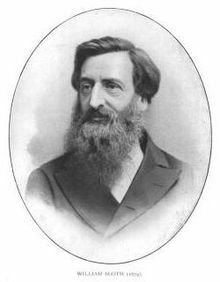 William Booth (1829 – 1912) founded the Salvation Army – a quasi-military religious organisation dedicated to offering humanitarian aid and tackling the material and spiritual poverty of the Victorian age. William Booth converted to Methodism as a young adult and was a fervent believer in evangelical Christianity. The Salvation Army spread to become a global humanitarian charity seeking to provide material aid and spiritual salvation. William Booth was born in Sneinton, Nottingham, England in 1829. Although his family were relatively prosperous, his father later lost his money and was declared bankrupt. William grew up in a situation of poverty. Aged only 13, Booth was apprenticed to a pawnbroker to earn a living. When Booth was about 15 he heard about Methodism and the message of salvation. He became an ardent convert and embraced the religion wholeheartedly. He read widely and was inspired to become a speaker and missionary seeking to save souls. Booth believed that those who rejected Jesus Christ as their saviour were doomed to eternal hell. He saw his life mission to save as many people as possible. After preaching to the poor and ‘sinners’ in Nottingham, Booth wanted to leave his pawnbroking job, which he considered sinful. In 1849, he left Nottingham to seek employment in London as a lay preacher. There were few jobs as a lay preacher, but Booth took to open-air evangelising and would tour the poor districts of London seeking to save souls. In 1851, Booth joined the reformers (Methodist Reform Church), and in 1852, he married Catherine Mumford. However, Booth was again frustrated at the lack of opportunities to preach within the Methodist church so left to be an independent evangelist. In 1865, Booth and his wife founded The Christian Revival Society. This was an organisation committed to helping the poorest and most neglected of the East End of London. It involved giving food, shelter and clothes, but also seeking to save people spiritually. At the time, there were many similar religious organisations committed to helping the poor, and offering aid to try and educate people into religious salvation. It was hard work, as the Christian missionaries often faced hostility from local people, who derided their evangelising. 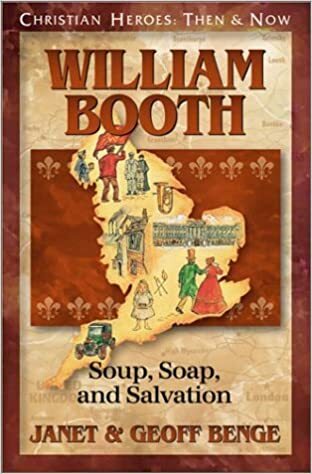 Booth and his wife struggled to raise sufficient funds to keep the mission going, but they never gave up and remain committed to serving the poor in the heart of the poorest areas in London. In 1878, they changed the name of the Christian Revival Society to the Salvation Army. Booth’s motivation was that he didn’t see himself as a volunteer, but a regular soldier serving God. The organisation was based on military principles. Booth was the ‘General’; they had their own flag, their own uniform, and ‘military’ songs based on Christian hymns. Other members were referred to as officers. The strict organisation and missionary zeal of Booth, helped the Salvation Army grow from humble beginnings to become a global organisation with a powerful presence in countries around the world. The Salvation Army was soon present across Europe, the US and part of the British Empire. Booth was a tireless worker, travelling to over 58 countries and becoming one of the best-known evangelists and charity workers of the age. Booth proposed practical solutions to the endemic poverty and ‘vice’. He offered educational and training schemes, seeking to offer prostitutes, homeless and migrants a chance to create a better life. He saw his Christian charity as filling in a gap left by the state. To Booth, the most important aspect of his work, was not the material aid but seeking to ‘save’ souls. However, offering material aid, was an excellent way to prepare the poor to see the virtues of the Christian religion. After a difficult beginning period and resentment from those who feared his evangelical Christianity and judgement of sinful activities, The Salvation Army became seen as a useful humanitarian organisation doing good in the slums of England. He received audiences with kings, emperors and presidents. William Booth of ‘The General’ as he became affectionately known as, died in 1912, aged 83 in Hadley Wood, London. The organisation he created, continued to grow and prosper after his passing. Citation: Pettinger, Tejvan. “Biography of William Booth “, Oxford, UK. – www.biographyonline.net. Published 3 August 2014. Last updated 15 February 2018.